Vegetables can be truly delicious when roasted. Healthy and easy to prepare, many vegetables' flavors are greatly enhanced by the roasting process; even their textures are enhanced, as they become soft on the inside and golden brown on the outside. Roasted vegetables can be prepared one day in advance and refrigerated overnight. This will save you at least an hour of work if you have a meal planned for the next day. The use of extra-virgin olive oil will keep the roasted vegetables from discoloring and maintain their lovely taste. Select a variety of vegetables. 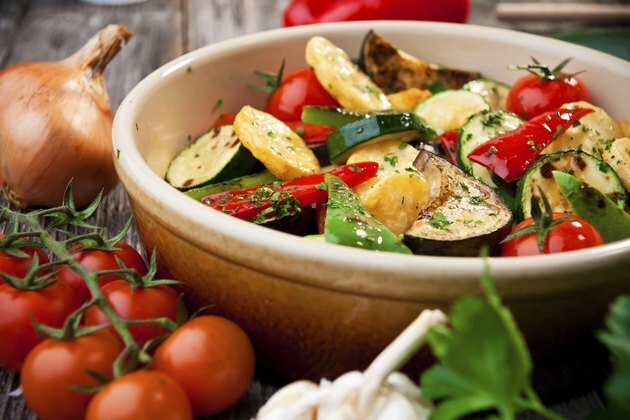 Eggplant, zucchini, peppers, mushrooms, potatoes, fennel and red onion are examples of excellent choices for roasting. You can also add other varieties according to your taste. Heat the oven to 425 degrees Fahrenheit. Rinse all vegetables under cold running water and prepare them to be roasted. For example, scrub the potatoes and peel the onions. Cut the cleaned vegetables into 1-inch cubes and spread the pieces in a casserole dish layered with parchment paper. Drizzle the vegetables generously with extra-virgin olive oil and season them to taste with salt and pepper. Around 3 tbsp. olive oil should be sufficient for 4 lbs. of cut vegetables, although more can be used to your taste. Place the dish in the oven and bake the vegetables for approximately 45 minutes or until golden brown. Check on and toss the vegetables every 15 minutes with a spatula. Remove the dish from the oven and allow the vegetables to cool to room temperature. Cover the dish with aluminum foil and refrigerate overnight. Reheat the vegetables at 425 degrees Fahrenheit for 15 to 20 minutes. Serve hot or warm. Cooking times will vary according to the vegetable type, so you may need to adjust it. If you like a more aromatic flavor, place the cubed vegetables in a bowl and toss them with 1 or 2 crushed or finely minced cloves of garlic before placing them on the baking dish. You can also add the olive oil, salt and pepper at this stage and spread the seasonings on the dish ready to go. For a touch of spiciness in your dish, add 1/4 to 1/2 tsp. cayenne pepper. Eggplant is delicious but absorbs oil like a sponge. If you have included it in your vegetable medley, add a little more olive oil to the vegetables before reheating. Do not overcrowd the dish. Leave a bit of space between the pieces; use an additional pan if needed.